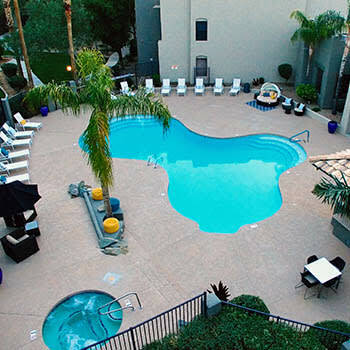 Enjoy a full menu of deluxe amenities at Cabrillo Apartments. Our community is ideal for spending quality time with family and friends or taking some time out of your day for yourself. Rise with the Arizona sun for a bit of cardio in the modern fitness center. Join in on a pick-up game of hoops with neighbors after school or work. Stretch your legs with a walk through the dog park with your best four-legged friend. No one could blame you if you chose to hang out poolside to work on your laptop or answer emails under the blue desert sky. Feel free to take advantage of high-speed Internet and office equipment at the business center. There’s a space to help with your every need at Cabrillo Apartments. Cabrillo offers all residents access to the Parcel Pending package delivery service onsite. When enrolled in the service, your packages will be delivered to your secure storage locker with access codes and updates delivered directly to you by text or email.